WP1 will focus on the coordination and management of the training network. 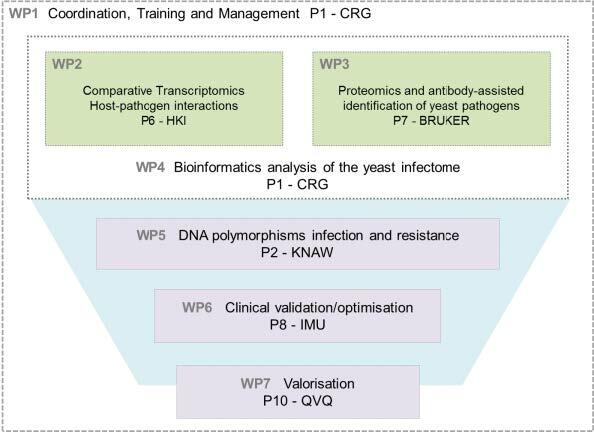 WP2 and WP3 will include a basic research component focusing on the same transversal topic: analysing host-pathogen interactions with the goal of understanding the molecular differences between colonization and infection, and their variation across Candida species. Specifically, WP2 will identify stage- and tissue-specific genes and explore possible clinical implementations to differentiate colonization from infection, and WP3 will focus on the diagnosis of infectious species and strains, and drug-resistance. WP4 is dedicated to the development of a bioinformatics infrastructure enabling integrated and highly automated analyses of omics data. WP5 will focus on the exploitation of genomic variability to develop genetic markers of virulent species and strains, as well as resistant traits. WP6 will critically validate all implemented approaches in a clinical setting. WP7 will focus on the valorisation of the validated tools to define their potential for effective translation into clinical practice. While the diagnostics component will aim to identify the broadest possible spectrum of pathogens, the research component will focus on the four most prevalent Candida pathogens: C. albicans, C. glabrata, C. parapsilosis complex, and C. tropicalis.